This story On Moving is part 3 of 3. I’m not writing this story out so that anyone will feel sorry for me. It’s been five years. We have once again settled. We’re in the house we will most likely be in the rest of our days. We have friends. Good ones. Our kids are thriving. Craig has a really good job, one that he loves and is a good fit for him. We’re in a good place. No, don’t feel sorry for me. I’m not unhappy with our life. But being back in Colorado Springs for exactly two weeks now has forced me to face some things I simply haven’t been able to face some 800 miles away. We didn’t just leave Colorado, we left a life. We started a new one. The life we left here is still going on. Stepping back in to it, even for a few weeks is so good and so hard. Coming back, my heart is thrilled to see the work, the ministry, the people here growing, thriving. Coming back and seeing that, my heart is sad to know we’re no longer needed here. Isn’t that how it should be, though? You work hard for so long and then God raises up a new generation of people to do what you’ve done, even do it better? It’s right. It’s good. And it’s hard. I drove the girls up Rampart Range Road last Sunday to take them up to Eagle Lake Camp. They’ve heard our stories over and over and over so that they’ve become their own. They feel an ownership over a place they barely remember, that maybe doesn’t remember them. I showed them where Craig and I met back in 1993. I showed them where my tent was (now a cabin) in 1994. I showed them where we lived when Maddie was just a tiny baby in 1999 and 2000. I showed them where we lived with Maddie and Chloe when they were both tiny babies in 2001. I showed them where toddler Chloe sat on infant Katie’s head during one of Craig’s talks to the summer staff in 2002. I showed them. And together we remembered. I’ve cried pretty much every day we’ve been here. I can’t even quite name the reason why other than I’m still grieving the loss of of the last five years with the people we became adults with so long ago. You can make new friends. You can make really good friends. But you can’t recreate this kind of history with anyone. So many of us got married within a 2 year span of each other, so many of us started our families around the same time. So many things we shared in common in both life and ministry. I’ve had the chance to look many of these dear people in the eye this week and tell them I’ve missed them. To tell them I’m sorry I was so excited about what the future held I failed to hold dear the past while I was still living it. To tell them I love them. I loved them. I will always love them. Facebook helps, you know? But it provides a false intimacy. None of us are going to share that we’ve struggled with infertility, job loss, marriage struggles, educational concerns, and other life struggles in a two sentence status update. These are the kinds of things you have to be present with people to know about and walk with them through. I’ve learned a lot of these kinds of tough things in the past week that has made my heart ache. Because I didn’t know. And there are things about me they didn’t know. We’re losing our shared history because of the distance. And I think that’s what I’m grieving this week. These transitions – they aren’t easy. They aren’t quick. And they don’t get easier with time. It’s just that continual process of moving on that we have to continually process. And as bitter sweet as it is and as cliche as it sounds, it really does make the thought of Heaven seem all the sweeter. As you can see from the photo above, we may be gone, but we still aren’t forgotten. I think my heart needed to see that this week. But here’s what else my heart needs to be okay with: life in Colorado Springs has been and will continue to move on without us. 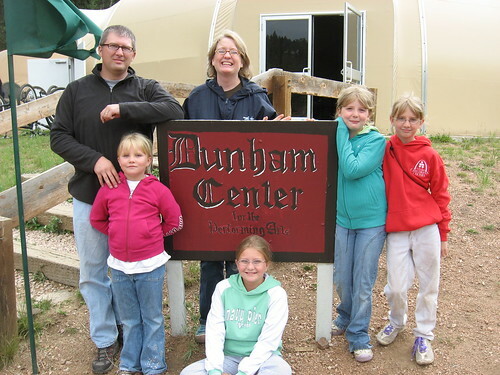 There will come a day in which the Dunham name will be a far distant memory to everyone associated with Eagle Lake Camp. We now live in St. Louis. And we’re going home tomorrow. Home. Where the Cardinals play ball, where the Arch remains an overpriced, but cool landmark, where we live ten minutes from the free zoo. Where we have new friends. And cats that make me itch. And a life. But it doesn’t make the leaving here any easier, but I will leave this time having made peace with that. We live in St. Louis. And I’m okay with that.